March marks one year since we funded the initial Kickstarter project to produce the COUNTERBLAST Adventure Battle Game. What better way to celebrate this month than to release a whole slew of COUNTERBLAST related things! You can learn more about COUNTERBLAST here. All this month the COUNTERBLAST Adventure Battle Game Core Rulebook is on sale for 20%! This book includes the Rulebook PDF. We have also discounted the Core Rulebook PDF to $5.99. Each of the five Faction Core Starter Sets are also 20% OFF. If you missed out on the Kickstarter project, now is the best time to jump in and try out COUNTERBLAST! The SALE items are here. From the previous post you will know that over the last several months we have been working tirelessly here at Bomb Squad Central to create the FREE Addendum 1.1 rules supplement. Today we can say HERE IT IS! This Addendum 1.1 PDF replaces, enhances, and clarifies some of the rules listed in the COUNTERBLAST: Adventure Battle Game Core Rulebook. It is more than just an errata file. The main focus of this document is to address the posts in the Facebook Group as well as all of the questions from the Forums to make sure the engine runs as smoothly as possible. We have been going through the rules and crew lists with a fine-toothed comb to make sure as much material is corrected and clarified to make the game as playable and as fun as possible. It also features printable Tokens & Counters, Templates, Gameplay Summary reference cards, Psionic Powers Cards, and Crew Rosters for use in the COUNTERBLAST™ Adventure Battle Game. 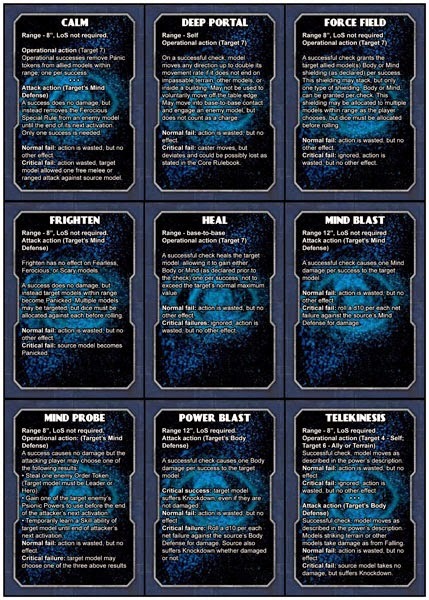 What’s more we have included all new Psionic Powers Cards that have updated stats and rules from the Addendum supplement. All of the various factions also have all new statcards which have been been added to the web store as well. These new cards replace all of the old cards printed in the book and have been formatted to make them easy to print and cut out. Due to the minor adjustments and tweaks involved in the clarifications it was best to work up new statcards for everyone. So, you can download the PDF files here with all of the updated faction statcards. Dr. Zardov and the Robot Menace is now available as its own Lancers Crew. This mad scientist terrorizes the Outer Reaches with his hordes of robots menacing the citizenry. His lust for immortality resulted in an accident that left his brain trapped in a mechanical body. He’s more machine now than man, twisted and evil. Set also includes FREE download of the Beta Statcard page PDF you can print to play.